Toy Helicopters - What you should look for. 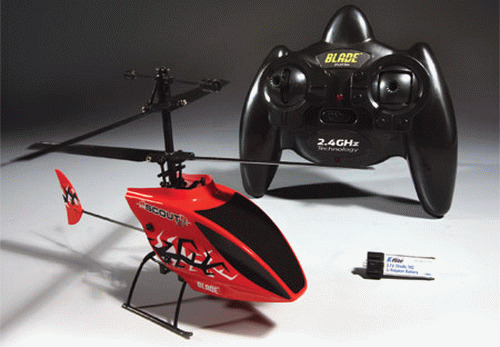 RC Toy Helicopters such as Air Hogs brand have basically made it possible for anyone to enjoy flying RC Helicopters. They are not complicated or maintenance intensive, they are quite easy to fly, and most are very inexpensive. True, they don't offer the same level and precision of flight control as a true hobby grade micro RC helicopter will, nor can you swap flight batteries in most of them for back to back flights. That said, if you are just starting out in the hobby and want to know if you even enjoy flying something remotely before investing a little more money in a true hobby grade bird, cheap toy RC helicopters are a viable option to consider. 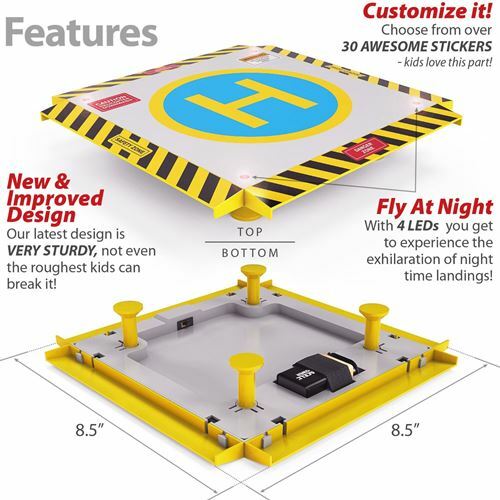 Incidentally, I also have a page specifically on choosing the Best RC Helicopters for Kids & Beginners , which explains in greater depth what the difference is between these low cost and disposable toy helicopters compared to micro hobby grade RC helicopters. Yes, toy RC helicopters are at best a short term device that will break or stop working within a week to a couple months (depending of course on how they are treated). Once that happens, they are destined for the trash bin. 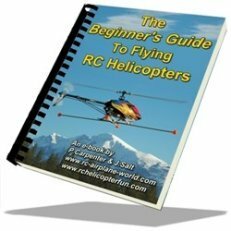 If you don't particularly want to throw your money away, again I recommend you take a peek at that best Helicopter for kids & beginners page I just mentioned or the video at the bottom of this page. If you don't mind tossing a few bucks out there however and just want to see what a toy heli is all about and still feel getting one makes sense just to get you or your youngster introduced & initiated to the hobby very easily and inexpensively, please continue reading. How Do Toy Helicopters Work? 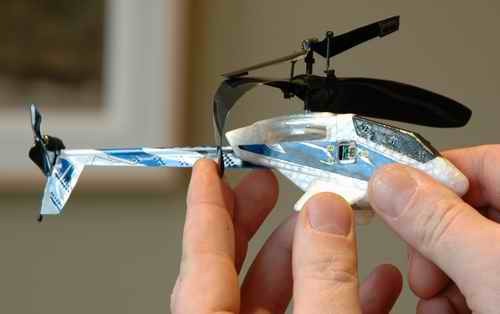 These were the first type of toy heli that were available for a low price. This basic single rotor design offers two channels of control - lift & yaw (turning). They use a single main rotor and a conventional tail rotor to counteract the reactive torque. The main rotor controls lift by speeding up and down, and the tail rotor allows right and left turns by speeding up and slowing down. Those are the two channels of control, speed of the main and tail rotor - very simple. 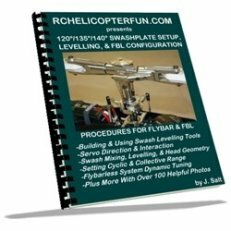 With a little bit of nose weight to shift the center of gravity forward of the main rotor mast, these very simple little 2 channel toy helis will slowly drift forward giving a rudimentary form of forward flight. The other 2 channel control method uses two counter or "contra" rotating rotors to supply both lift and yaw control - this is known as the "coaxial design" (link takes you to my page on how they exactly work). Again, weight is used to change the center of gravity to allow a slow forward or backward drift. The precision of control in any 2 channel toy heli as I mentioned is poor. Nonetheless, they are still fun to fly but will get boring extremely quickly! 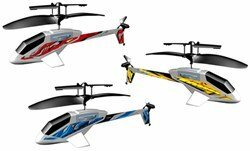 Without doubt, the most popular type of toy helicopter on the market right now are the 3 channel Coaxial Type. The Syma S107G is pretty much the top selling one due to the almost give away price of $15 to $25 bucks at most retailers, and it's also one of the best quality toy helicopters currently on the market. Unlike most toy helicopters, you can also get replacement parts for them; so they could be considered true hobby grade in that respect. For the price, the Syma S107G is hard to beat! Just as with the 2CH coaxial toy RC helicopter, these toy versions use two counter rotating main rotors and by altering the speed of the rotors to one another, you can turn (yaw) the helicopter left and right (1st channel) as well as control lift (2nd channel). The 3rd channel of control is used to control the speed and direction of a small tail rotor, but this tail rotor is mounted horizontally, not vertically like on most helicopters. It's normally called the "tail fan" in this configuration. The way it works is if it blows air down, the tail of the toy helicopter will pitch up slightly and the heli will drift forward slowly. If the tail fan direction is reversed and blows up, the tail will pitch down and the heli will slowly drift backwards. It's slow and sluggish at best, but better than shifting the center of gravity as it gives some forward backward movement control. 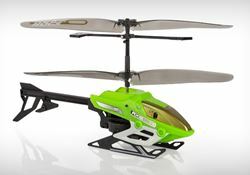 This is the most expensive of the toy type helicopters, but offers the most fun and best control. 4 Channels of control give you: lift, forward/backward (pitch), left/right (roll), and the ability to yaw (turn). I have a section on quadrotor RC helicopters if you wish to learn more about how they work. 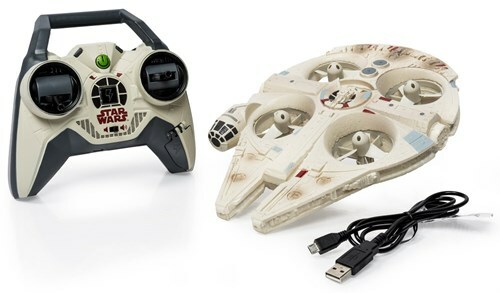 There are certainly many various types of toy quadrotors on the market these days, but the Air Hogs Millennium Falcon is one of the most popular right now. My neighbor recently got one for his kids and I was quite impressed at how well it flew. It's certainly not up to hobby-grade micro quadrotor standards when it comes to build quality and stabilization technology, but it's pretty good for the price. Not to mention it looks good and has some neat little extra sound features. Hobby grade quality and control performance at toy helicopter pricing and flying ease! Nope, it's not a toy grade heli, but the price would make you think otherwise. 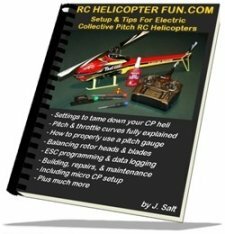 I had to include the Blade Scout CX on this page for those of you who know you want more than a toy grade heli but don't want to spend a lot and still get into all the benefits that go along with a hobby grade machine. Namely better quality/performance, the ability to replace/update parts, & purchase extra flight batteries for back to back flights. The Blade Scout is a 3 channel micro coaxial but unlike the 3 channel toy coaxial helis that use those little horizontal tail fans to pitch the heli forward and backward, the Scout uses true cyclic control (a tilting swashplate to change the pitch of the main rotors). This will give you much better hover and directional control. The Scout CX also incorporates a true heading lock gyro for impressive yaw stability and control. In addition to the obvious control and performance improvements over a simple toy heli, the Blade Scout comes with a 2.4 GHz radio instead of the much more basic infra-red controller found on most toy grade helicopters. This provides a superior communication link to your heli and is not effected by high levels of ambient light or other infra-red interference by other IR sources or reflective surfaces. All this technology for only $50.00 USD! I've been so happy with this little heli and think it's by far the best choice of any of these toy type micro RC helicopters from a performance/quality to cost ratio. In short - this is the heli I've been gifting to several newbie heli friends & family over the past few years. The Scout remains to be a solid choice & are well received. Toy price but hobby grade quality and performance - very sensible & logical purchase in my opinion. There are also a growing number of inexpensive 4-channel palm sized hobby grade quad-rotor helicopters for under $40 bucks or so. The Hubsan X4 H107L pictured above is one of the better ones on the market. It could certainly be considered a toy considering the very low cost and easy flying characteristics; but it offers better electronics, strong build quality, and of course you can change the flight battery for back to back flights and get replacement parts to fix it when things break. Most in the hobby consider this little micro sized quad rotor the best in its class. I've had one for several years and they really are amazing little quads. They are however fairly agile and responsive so younger children may find them too difficult and frustrating. 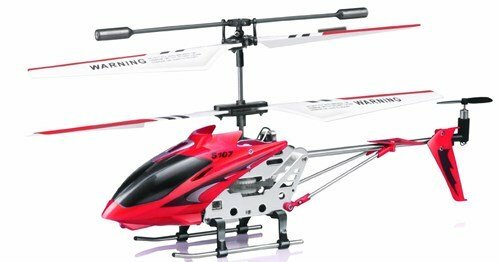 I did however at least want to mention the Hubsan H107 on this page because for the toy price, it provides lots of fun factor and has better value over the Air Hogs Quad Copters. I talk about it in more detail on my kids/beginner page. 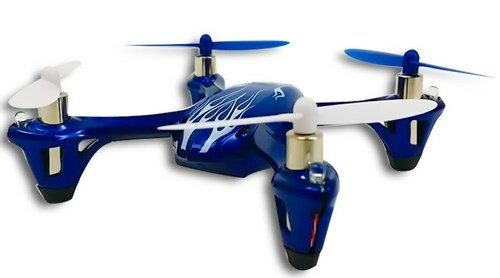 Toy grade RC helicopters are introducing so many kids and adults alike (total beginners) to the wonderful world of RC flight and in a very inexpensive manner. Many people who are first introduced to the hobby with one of these simple (generally impulse buy) toy helicopters are bitten by the RC helicopter bug and then progress into better quality hobby grade radio controlled helicopters. For this reason alone, even if toy RC helicopters are more or less disposable items, they do offer value to our hobby in general. My first toy helicopter was a VertiBird, and although it wasn't RC, it had a profound impact on my interest in helicopters that continues to this day. No question, I would much rather see people stop throwing their money away on disposable toy helis and realize a quality micro hobby grade heli or quad rotor is not much more money, but even these toys provide lots of fun albeit short term fun. They weigh next to nothing and because of that low mass, slow rotor RPM, and slow flight speeds, they don't break that easy. In fact, the motors and batteries generally fail before a part breaks.